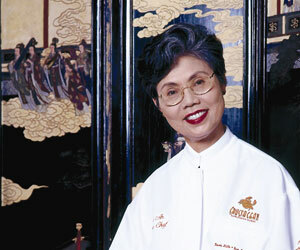 Deemed "The Mother of Fusion" by San Francisco food critic Michael Bauer, Chef Helene An is truly one of a kind. Her cooking is so unique, in fact, that David Beck from the San Jose Mercury News told her he wanted to marry her in order to secure her recipes—then divorce her! Not to worry, though. Chef An is already married with three daughters, and she has no intention of letting go of those fabulous recipes. Chef An was more than willing to let go of her story, however, and she told it recently to TravelsinTaste.com. We had the privilege of speaking with her about her culinary heritage, her cooking style, her mastery of kung fu and even her famous "Secret Kitchen." There's a reason that Bauer calls Chef An "The Mother of Fusion." As a young girl in pre-Communist Saigon, she grew up in a wealthy Vietnamese family that entertained at least 10-15 people every day. They had three chefs-one French, one Vietnamese and one Chinese-and she was always in the kitchen looking at what they were cooking and asking them questions. As she wasn't particularly keen on having the same meal every day, her mother told her, "In that case, if you want something more exciting, change the menu every day." So, she did. On a daily basis, young Chef An went in and talked to the chefs about what she liked to eat. She talked to them about simple, healthy, basic food. Not too fishy, not too gamey. She learned from the Chinese that they always use some kind of herb, such as ginger, to eliminate the gaminess from chicken, and that they used apples to do the same thing with fish. They used different ingredients to take the oil out of the fish so that when it was cooked it tasted better, more natural and healthier. Little did Chef An know at that young age that when she was older her life would change and she would rely on those skills to build a very successful cooking empire in the United States. She did just that, though, and her cooking kingdom is now comprised of three California restaurants (Thanh Long, Crustacean San Francisco, Crustacen Beverly Hills) with a fourth one (536 Sutter coming soon), as well as a catering business, all of which were built not on formal training, but on the informal lessons she learned during her young kitchen visits. After all, when she left Saigon in 1975, Chef An settled in San Francisco and realized that she could be neither the best at French cooking, Vietnamese cooking nor Chinese cooking. What she could be, however, was someone who put these three cuisines together in order to create something extraordinary. Thus Bauer nicknamed her "The Mother of Fusion" in celebration of her style, which continues to combine healthy, simple, elegant and light cuisines.